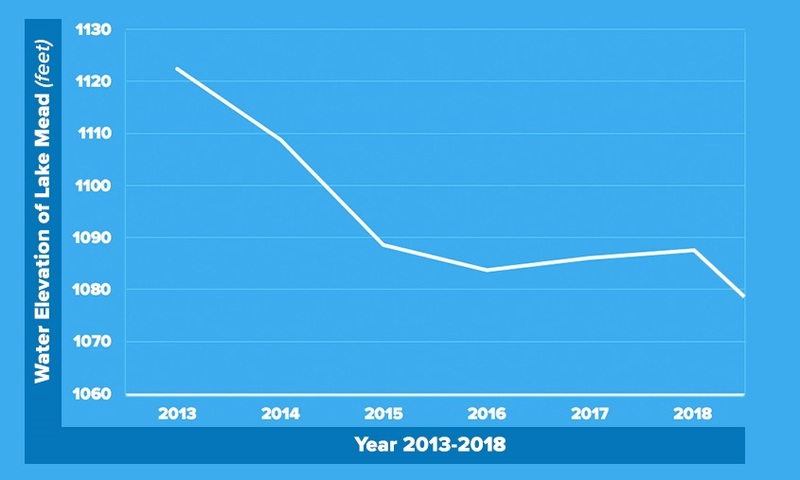 A 24-month projection released Wednesday by the U.S. Bureau of Reclamation shows we skirted federal mandatory water cuts this year, but prospects for 2019 and 2020 do not look good. 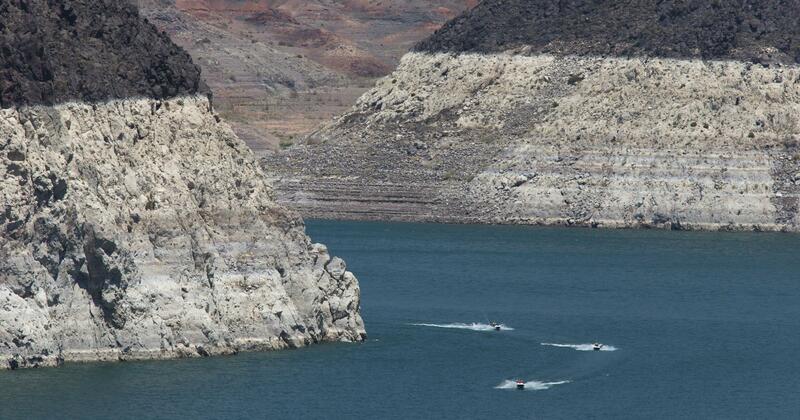 The forecast found Lake Mead water levels will end this month at 1,079 feet – a mere four feet away from the 1,075-feet threshold that would trigger a federal shortage declaration and mandatory cuts. How did it come to this, and where do we go from here? Located nearly 25 miles from the Las Vegas Strip, Lake Mead is the largest reservoir in the U.S. and supplies 40 percent of Arizona’s water. Factors like population growth, declining snowpack and rising temperatures have made drought the norm and are stretching this vital source of Colorado River water to the limit. The latest Lake Mead forecast comes a week after a 40-member steering committee in Arizona held its second meeting to craft agreements between Arizona water agencies and water users that would enable the state to sign on to the Lower Basin Drought Contingency Plan (DCP) – a plan developed by Arizona, California, Nevada and the federal government to reduce risks in the Colorado River system. The precariously low Lake Mead water levels projected this week make this steering committee’s work more important than ever. Developing intra-Arizona conservation and water sharing agreements and gaining approval by the Arizona legislature next year will hopefully be among the last steps in a multi-state effort to address the decline in the water elevation of Lake Mead, which also supplies water to California, Nevada and two states in Mexico. It’s time for Arizona to fully acknowledge the region’s grim hydrology and implement plans to create a more sustainable future. Reaching an agreement on the Lower Basin DCP is critical to Arizona’s long-term water security and to the state’s economic future. Failing to adopt a plan could result in federal agencies stepping in to impose mandatory cuts overnight. Environmental Defense Fund is participating in the Arizona steering committee to ensure that Arizona reduces its withdrawals from Lake Mead to create a more sustainable Colorado River water system. My colleagues and I believe the near-term solution – to operate under a Lower Basin DCP agreement with our neighbors – should emphasize conservation and water sharing agreements among Arizona water uses. Leaders in Arizona need to collaborate to take bold actions and expand the use of proven conservation strategies like the “system conservation” agreement reached last year. This multi-agency agreement compensated the Gila River Indian Community to leave 40,000 acre feet of water in Lake Mead – the amount used by approximately 100,000 people in a year. The good news is that the Arizona steering committee is off to a promising start. At its first meeting on August 9, the committee created a smaller working group to focus on one of the biggest challenges – a mitigation plan for Central Arizona agriculture, which could be heavily affected by cuts. Options on the table include using some of the water stored by Central Arizona Project in Lake Pleasant or creating a fund to purchase mitigation water from higher priority water users. Several members of this Central Arizona agriculture mitigation working group have already been meeting over the past several months and, with this head start, I am hoping they will bring some promising ideas to the full steering committee at its next meeting on August 23. I am cautiously optimistic that the steering committee can succeed in hammering out intra-Arizona plans for increased conservation and water sharing agreements by the end of this year. With those plans in hand, we would have the support we need to convince the state legislature to pass a concurrent resolution (as required by Arizona law) to authorize the Department of Water Resources to sign the Lower Basin DCP. Arizona is running out of time to figure out new ways of conserving and creatively sharing an increasingly scarce water supply. We need to collaborate now in order to avoid catastrophic and economically destabilizing impacts in the very near future. Adapting successfully to the new water realities in our region – reduced Colorado River supplies and increased uncertainty and risk – will require increased agility, collaboration and innovation. The success of the Arizona economy and health of our ecosystems depend on it.